I will tell you that thanks to so many preppers and self reliance gurus the internet is so full of info its uncanny. 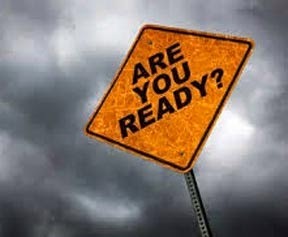 There is a library of info on how to prepare for most any situation that could come our way. Some of this is hypothetical and some is take from direct experience. Either way it seems to get the mind working and people prepping. For that you must be grateful. In a way identifying those threats was step one and mitigating those threats through the exchange of information was step two. Its time for the next step. I think the only way we can improve now is to put what we have learned to the test. I think the time is fast approaching that we begin testing our knowledge and skills with physical prepper challenges. My Survive the bugout challenge kicks off in just a few days and will be a great example of what I mean when I say a prepper physical challenge. This will task contestants with bugging out and completing certain tasks on their bugout. This will be a lot of fun. Moreover it will open our eyes to gaps in our bugout process. Its the next step and I see more like this in the future. On this episode I want to brainstorm with you on other types of prepper physical challenges that we can test ourselves with. I want to think about skills and scenarios that can be tested. We will also talk about the coming bugout challenge and how to join in the fun last minute. This episode will be as good as the crowd interaction. I have a ton of ideas but i know the I AM Liberty faithful will add another level of depth to this conversation. How can we train martial law readiness? How can we train off grid survival? Hkw can we train escape and evasion while making it fun and engaging. We are talking about the next level of preparedness tonight. Bring your thoughts on the prepper physical challenge. Listen to this broadcast or download “Physical Challenges” in player below! Next: Next post: 4 Preps You Can Do Right Now for an Economic Collapse!